Glaucoma FAQ – Silent Thief of Sight ? 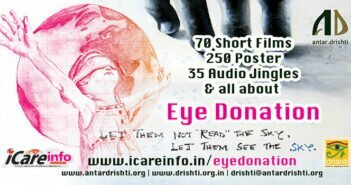 All around the world about 6.5 crores people are struggling against Glaucoma, among which 1.5 crores are in India. If talk about the Glaucoma Society of India survey, the 12 percent of people becoming blind are because off Glaucoma out of total blinds. In this Glaucoma FAQ Mumbai based world renowned Dr. Quresh B. Maskati simplifying Glaucoma by Answering common questions about Glaucoma. If you did not find answers in this Glaucoma FAQ, you can contact us with your questions. We will be glad to help you out. I Simply put, it is a disease in which the pressure inside the eye is more than the eye can tolerate. The optic nerve of the eye, which is sensitive to pressure, starts showing signs of deterioration gradually as the pressure remains high. 2. How do I know if I am suffering from glaucoma? How do I know if I am suffering from glaucoma? In a majority of cases, there are no symptoms. The field of vision starts gradually constricting from the periphery towards the centre. Finally only a tubular field is left. That is when the patient starts bumping into objects or stumbling frequently over uneven pavements. Unfortunately, most elderly patients ascribe the gradual diminishing of visual fields to cataract and delay visiting their eye doctors, thinking, “I can still see distant and near objects clearly – my cataract is not yet ready”. Unfortunately, she does not realize that though the central vision is perfect, it is the peripheral field, which is being irreversibly lost, due to glaucoma and not due to cataract. Little wonder then, that glaucoma is called the “silent thief of vision”. In a small percentage of patients, who suffer from ‘narrow angle glaucoma’ frequent change of glasses, headaches occasional redness of the eyes may be early symptoms. These patients can also develop an ‘attack of glaucoma’ in which there is severe pain redness and watering of the eye. In some cases, there may be associated nausea or even vomiting during the acute attack! 3. I regularly go to my optician for change of my glasses number. Can he not diagnose glaucoma? No. 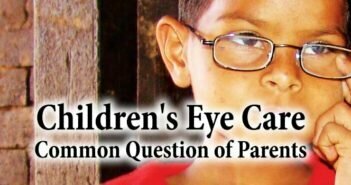 He is not trained or equipped to diagnose eye diseases. He is excellent for checking your spectacle numbers. However, you need to visit your eye surgeon or ophthalmologist at least once at age of 40 years and then ideally annually thereafter. He alone is equipped to suspect or diagnose glaucoma. 4. How does my eye surgeon diagnose glaucoma? Your eye surgeon will take your eye pressure, either in the lying down position (Schiotz tonometry) or in the sitting up position (applanation tonometry, non –contact or minimal contact tonometry). An isolated high reading, like in blood pressure readings need not signify glaucoma, though it will make your ophthalmologist look closely at your optic nerve (which is the only nerve of the brain visible to a trained doctor) through an instrument called an ophthalmoscope. If the nerve looks like it is getting compromised or pressed upon, he may record these finding by drawings or taking a photograph. He may also study the loss of peripheral vision by doing a computerized visual field examination. Glaucoma is also known to induce a loss of ability to distinguish between objects when the contrast between them is low. This fact is used to do contrast sensitivity tests to better diagnose early glaucoma. Open angled glaucoma is distinguished from narrow angled glaucoma by studying the angle of the eye (the area from which the fluid of the eye egresses) with a contact lens known as a gonioscope. Other high tech tests for difficult-to-diagnose cases include Optical Coherence Tomography (OCT) and Nerve Fibre Analyzers. 5. Having diagnosed glaucoma, is there a medical cure? Like diabetes, glaucoma can be kept under excellent control in most cases by drugs – the advantage is that usually the patient only needs to put an eye drop once or twice a day. In the initial stage, the patient may need to take oral tablets for a short time and then can be maintained on eye drops. Your eye surgeon will determine the ‘target pressure’, that he judges, is safe for your eye. He will try and keep your eye pressure at or below the ‘target pressure’ so as to prevent optic nerve damage. He will monitor this by calling you at regular intervals to check your pressure, look at the optic nerve and check your visual fields. Depending on these parameters, he may change or add new eye drops from time to time. Alternatively, if he is not happy with the response of your eye to medical therapy, he may resort to surgery. 6. Can I not avoid surgery? What about laser treatment? Lasers are used in glaucoma for various indications. If the angle of your eye is narrow (determined by gonioscopy) you are in danger of developing an acute attack of glaucoma (like a heart attack if your coronary vessels are narrowed), a laser can be used to make a small hole in the brown of your eye (peripheral iridectomy). This does not cure your glaucoma; it only prevents an acute attack. In open angled glaucoma, laser can be used to widen the openings in the angle for fluid to drain out, thus reducing the pressure. 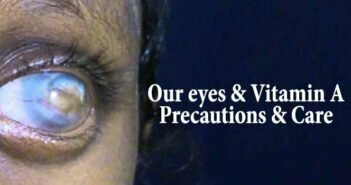 However, this is increasingly being seen by most eye surgeons as a temporary measure at best, rarely being effective beyond five years at best and frequently failing long before that time. 7. How safe is surgery? I have heard everyone after glaucoma surgery develops cataract, is it true? Glaucoma surgery is fairly safe and complication free. It involves raising a flap of the white of the eye, the sclera and making a new drainage pathway for the fluid of the eye to escape. This surgery is known as trabeculectomy. This flap is then closed by sutures or stitches, which may or may not require removal. This surgery does hasten the onset of cataract in a small percentage of patients. You have to remember however, that these patients are elderly and usually have some cataractous changes in their lenses even before glaucoma surgery. Also modern cataract surgery is equally safe and effective in eyes previously operated upon for glaucoma. In some patients, who have a significant amount of cataract and glaucoma, your eye surgeon may do a combined glaucoma and cataract surgery with intra-ocular lens implant, all in one sitting. 8. I have heard there are some newer surgical procedures which are safer than trabeculectomy. What are these? Since the last decade or so, there are a few newer procedures which are “non-penetrating”, i.e. the anterior chamber of the eye is not entered. This is supposed to avoid the dangers of causing too low a pressure after surgery. However, these procedures have a marginally less percentage of success in the long term and are technically a little more difficult to perform. 9. What about “Glaucoma Valves”? You are remarkably well informed. In those patients in whom trabeculectomy has not worked or will not work, the use of glaucoma valves has shown great promise. Earlier they were being used only in failed glaucoma operated cases, but now they are also being used as a primary procedure in select cases. As their name suggests, these are artificial, usually plastic (PMMA) devices which have a tube placed in the anterior chamber and a valve at the end of the tube. This allows drainage of fluid from the eye when the pressure is raised and blocks the drainage when pressure is normal or low, thus preventing too low an eye pressure. 10. Does surgery guarantee cure for glaucoma and freedom from glaucoma medication for a lifetime? I wish it were true. In 80-90% of cases, the visual fields may stop deteriorating and the pressure may remain below target forever. However there is a 10-20% possibility of the pressure remaining uncontrolled or visual fields continuing to worsen even after uneventful surgery. This may happen immediately after surgery or even several years after seeming ‘cure’. Therefore, even after successful surgery you should continue to see your eye surgeon at regular intervals as called, to confirm, “all is still well”! More importantly, we must realize that at best, surgery can only prevent further loss of vision- it cannot restore vision already lost, unlike cataract surgery. In other words, delaying glaucoma treatment, medical or surgical, is like going down a one way street- there is no coming back! 11. What is the role of diet and exercise in glaucoma? Several recent studies have blamed excess intake of caffeine as a risk factor for glaucoma. On the other hand, regular exercise such as walking, swimming, jogging is known to have a beneficial effect on glaucoma control. 12. Who are the people at greater risk of developing glaucoma? Those with a family history of glaucoma, those with history of ocular trauma, diabetes or high blood pressure, those with small eyes with narrow angles, those with minus number glasses and senior citizens. However, no one is immune from glaucoma. As this disease is more prevalent after the age of 40, one must have an annual check-up by the eye doctor after that age. One should consider an annual check-up starting at an earlier age if one has any of the other risk factors. 13. Can a person who has undergone glaucoma surgery donate his eyes after death? Yes, he most certainly can, provided the cornea is clear.